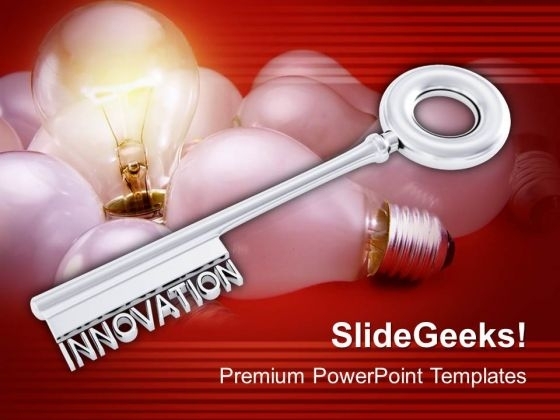 A Golden Key Innovation Concept Symbol PowerPoint Templates And PowerPoint Themes 1012-"Microsoft Powerpoint Templates and Background with golden key with word innovation" -A Golden Key Innovation Concept Symbol PowerPoint Templates And PowerPoint Themes 1012-This PowerPoint template can be used for presentations relating to-"Golden key with word innovation, success, security, business, marketing, finance" Our A Golden Key Innovation Concept Symbol PowerPoint Templates And PowerPoint Themes 1012 are colorful compositions. Their array of colors will catch the eye. The colour contrasts of our A Golden Key Innovation Concept Symbol PowerPoint Templates And PowerPoint Themes 1012 are aesthetically designed. They put the focus on key factors.